I can't promise I will do one of these every week but I do love the idea of keeping track of how I am feeling/how the pregnancy is going. 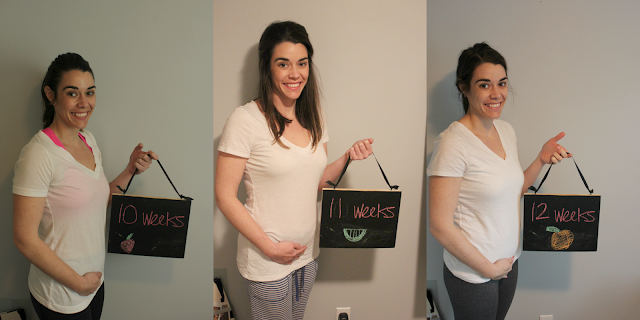 We started taking weekly photos at week 10. I was just reviewing them and am amazed at the difference in just weeks 10, 11 and 12. Warning these aren't the best photos but they do the job. I'm hoping to remember to wear a white shirt each week to show the progression. Aversions : Sadly coffee has not sounded good for a while but it is getting a little better. Other aversions come and go. There are nights I plan dinner and then go to cook it and have NO desire to eat that meal. Maternity clothes : Not yet! Best thing so far : Finding out with Mister and sharing the news with friends and family. We've had some really fun reactions. Looking forward to : Finding out the gender! Sleep : So far, so good sans getting up to go to the bathroom frequently. Nursery : I am dying to start designing the nursery! Not much will happen in there until after we find out the gender. I love seeing your bump progress! I lived off toast and cereal for the first 12 weeks, so no shame in not liking what you cooked for dinner! I'm voting boy!! I share your enthusiasm for finding out the gender because then I can go hog wild on gifting!!! There are many car transport companies in Noida Extension. But dealkare is one of them.